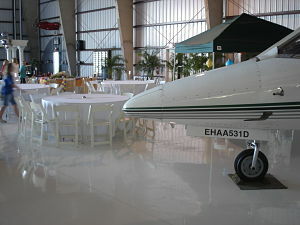 The silent auction and “ballroom” was in the hangar, overlooking the runway. One of the stories in the August 2009 issue of Small Market Meetings was “Planes, Trains, and Automobiles: Transportation Museums are on a Roll.” The article discussed the many types of events held in transportation museums. I haven’t conducted a gala in a transportation museum yet, but I have experience conducting auctions in transportation facilities. This article covers a school auction held in an executive airplane hangar. An unusual fundraising auction venue can make a guest do a double-take when considering whether to attend your gala. If it comes down to attending your function versus another event, they might very well opt for yours based on the unique venue. They might be more interested in seeing a place they don’t get to see everyday. This hangar was a fun and popular place for this school’s annual event. 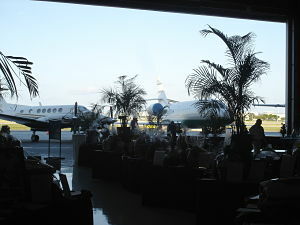 The favorite spot for the guests to gather was near the open hanger doors where they could enjoy the view. The wide open space allowed the auction procurement and decor committees to have great flexibility in adjusting the facility to meet their needs for 200 guests. On the flip side, a super-slick, bright white concrete floor can be slippery to high heels. Airplane hangars are definitely worth considering if you’re hosting a large event. One of my Manassas, VA-based clients attracts ~1,000 people attend their large community fundraiser. It’s usually held outside, under a community pavilion. But when rain threatened one year, they moved it inside to a nearby hangar. They got great reviews! Auction committees should take some precautions when booking a nontraditional space. Every venue will have its challenges. Tour the site and think about flow (especially for check-in/registration as you’ll probably need access to outlets), food stations, and position of silent auction tables. For hangars, the most difficult issue will be getting the sound system right. Sound will bounce off the hard surfaces and can make an auction become uncomfortably loud and hard to understand. Work with an experienced A/V company to counter the problems. P.S. The article in the magazine featured the National Corvette Museum in Bowling Green, KY; the Virginia Museum of Transportation in Roanoke, VA; and the Pima Air and Space Museum in Tucson, AZ. I just happened onto your website and was taken aback with the article about holding a fundraiser in an airplane hangar. I think that is just fantastic! I wish I could find a location for our school’s annual fundraiser that would just blow people away and entice them to attend. Welcome to the Red Apple community, Lee! Thanks for stepping up and helping to plan your school’s auction. Unusual venues such as airplane hangars, cool homes, museums, barns, or other interesting places do have a way of drawing interest. I hope you find something in your community that works. While you’re visiting, let me encourage you to sign up for the Auction Item Guide, too. I’ll be updating this free resource in the next few days, so you can grab the 2014 version now and get the 2015 version later this week.